Bus boy and ice cream scoop at a Howard Johnson’s restaurant when I was 15. The owner, Skip, terrified me because he was always yelling at people over minor mistakes. I had grown up with a loud and aggressive father so I was not afraid of yelling but Skip was particularly erratic and was an early influence on my resistance to petty tyrants.I learned that there is a huge difference between a good boss and a bad boss and I’ve placed a lot of value on the quality of the people I work with ever since. The high quality of the people in the School of Communication is what attracted me to FSU. My colleagues make this a great place to work. If you were to write a personal memoir, what would you name it? I went to Jr. High and High School in Winchester, Massachusetts but we had family property on Lake Winnipesaukee in NH and spend most weekends and all summer at that house. My longest friends are from NH and the Massachusetts house was sold many years ago. I inherited some of the family property in NH when my mother died two years ago and I am doing my best to make sure my kids get as much time on Winnipesaukee as possible. NH has always been my homing beacon and I often dream about the lake and the people in NH.My experience around the lake through four seasons has been a huge influence on my interest in environmental issues. I am often struck by the conservation ethic around New England compared to an explicitly hostile environmental rhetoric that dominates Florida’s current political leadership. In a state that relies so heavily on tourism – based on a clean environment – I am often amazed by the short sighted, self-serving political arguments used by so many politicians here in Florida. The thought of advancing your own career at the expense of clean water, air, beaches or land conservation is the height of narcissism and reflects a deep failure to lead Floridians toward a sustainable future. The results of this anti-environment attitude have left Florida at the bottom of the rankings on issues of clean air, urban sprawl, congestion, poor public transit, renewable energy and a host of other environmental measures. The fact that there is no automobile inspection in Florida is an example of public policy that has abandoned the public, leaving us all vulnerable to faulty brakes and toxic emissions from cars that should be off the road. What is your favorite class you’ve taught? I have 2 favorites; RTV 4332/5325 Documentary Video Production and IFS 3033 Media Culture and the Environment. Documentary is what led me into academia in the first place and environmental issues have been important to me from an early awareness of the anti-nuclear protests at the Seabrook nuclear plant in NH in the 1970s. Both these classes encourage students to go out and investigate the world and then come back and share the results with the class. So often student work only passes between the student and the faculty. I see students excel when they know their peers are going to look at their work. The environmental class is particularly rewarding because I see students light up when I help them connect the dots on climate change and other environmental issues.I think students have a nagging sense that the state of the Earth is not right – despite what the governor and others are trying to tell them – and they are eager to see the facts of the science behind climate change. When students begin to realize that the political class in FL (and the US) has been aware of the science of climate change since 1988 (when NASA scientist James Hanson first testified before Congress) and they have done nothing to mitigate this slow motion train wreck, the students begin to get motivated to participate in civic life and work toward protecting the planet they are going to inherit. What is your favorite place to grab dinner in Tallahassee? I will have to say Vertigo. I love to be able to bike or walk to Vertigo and they do a great job offering new options and doing local sourcing for a lot of their items. They always have a great vegetarian option and they are always innovating and trying new items. I am a musician – playing upright bass, guitar and mandolin. I have been in many bands over the years though at the moment I am between projects. I have a lot of musical friends here in Tallahassee (and all over the US for that matter) and whenever we get together, music happens. I’ve always wanted to address social issues and education is the first step to transformation. Teaching is a great way to work through an issue with a group of smart, motivated people. I find students have a lot to offer and I am always amazed by the ideas and insights they bring to the table. I often learn as much as I teach when I am in the classroom.My father’s first career was an Episcopal minister. He left the ministry in 1970 when I was 6, choosing to go work for the government in the Dept. of Health, Education and Welfare, administering the Head Start Program. He always said he did more good for people in HEW than he ever did as a minister and he often admonished us to make this world a better place. He was never a literal believer in the Bible story and instead emphasized the value of the stories as parables and lessons to be applied to the here and now, not some virtues to be tallied up to get in into heaven. This emphasis on engaging this world has always stuck with me and shapes my view of the academy. While I see others in the academy interested in oblique theory and writing in an impenetrable academese, I am more interested in reaching a broad audience and translating ideas within the academy, using them to make a difference in the world we live in. What is your favorite place you’ve traveled to or where would you like to go? I would like to travel to Australia and New Zealand but the thought of sitting in coach seats for 16 hours when you are 6’5” is enough to make me want to stay put. How many football games have you attended? One. I don’t need to see another one. I am always a little freaked out by mob displays of allegiance and uniform arm waving salutes. It all seems too similar to some of the worst examples of human behavior in the 20th century. I am also horrified by the unpaid physical abuse the players endure while the coaches, ESPN and all the people on the sidelines make millions. Given what we know about the lifelong effects of concussions, the student athletes are risking their lives in hopes of a “Wonka-like” golden ticket – a ticket that grants them the chance to continue the physical damage albeit with a large monetary reward (that can be used to pay the guaranteed medical bills). This really is unbecoming of an institution of higher learning and I hope this system will crumble in my lifetime. As players lives are cut short through the act of playing football, we are really only one step away from The Hungar Games – I guess that’s why these films are so popular because they help us see the horror in our midst. I don’t think I can reduce my career to one moment. I think I am proudest of the family I am a part of – my wife Ansje and our two amazing kids, Winni (11) and Jasper (7). All time favorite is probably Neil Young. I would start a foundation to support the production of environmental documentaries. The foundation would also host a music festival that would include giant puppets and interactive performance art. In honor of Jay Rayburn, I will have to say Rules for Radicals by Saul Alinsky. This book maps out a series of strategies for citizens who want to confront unjust systems of power. I think this book is important because we are currently facing unprecedented concentrations of wealth where billionaires think they can hand pick politicians and then have those politicians serve corporate interests as opposed to the public interest. I guess you mean “more famous” 😉 . I’m not done yet and I’m not sure what might be remembered as the “big idea” but I would like to think there will be some marginally interesting detritus when I’m gone. Annotated Grateful Dead Lyrics for 500 please. Yes, we have a 3 year old border collie named Bella. She is awesome; loyal, smart, hard working and genuinely nice. But don’t cross her – she was the runt of her litter and she is fiercely protective of our kids and the house. Not unpredictable, just protective if she senses danger, hostility or political corruption. When did you start working at Florida State University? September 2001. I came down to interview in January on inauguration day when George W. Bush was being installed. I was pissed that day, swearing at the airport TV monitors, feeling like our democracy was being high-jacked.My first night in Tallahassee, I was taken to the “Inaugural Bawl,” an event hosted by the Mickee Faust Theater troupe. This was a collective howl by the Tallahassee progressive community who has endured the media occupation during the election recount. Tallahassee was ground zero for the biggest travesty of modern US politics and this “Bawl” was a collective (and creative) venting of the anger and frustration at the decision to stop the vote recount and deny American’s their right to have their votes counted. At the Bawl, I met at least half the faculty and my future Dean. I called my wife that night and said, “I never would have guessed it but we might have to consider moving here.” We came to FSU in August 2001. Then of course we had the terror attacks of 9/11/2001 and that unleashed what has turned into permanent wars, a surveillance state, and an economy structured around inequality and barbaric individualism. I was able to see the premiere of the film Racing Extinction at Sundance in January. This is an amazing documentary about the 6th major extinction that we are in the middle of right at this moment. Prior to this the most recent extinction was 65 million years ago when the dinosaurs died off along with 50% of all other species. The Cretaceous extinction is thought to have been caused by an asteroid striking what is now the Yucatan Peninsula. Today, the cause of our current extinction is human activity. According to United Nations Intergovernmental Panel on Climate Change, we are at risk of losing 20-30% of all species by the end of the century if we don’t address our current carbon emissions. This is an astounding statistic and is at the root of my academic inquiry – trying to understand how to make people look up from their mesmerizing screens and do something about this impending collapse. That I get to read, write and think about the most pressing issues of the day while working with students who are learning to care. It is an incredible privilege that comes with it the obligation to respond to the conditions of physical and social world. I often say this is the last best job, even as universities are under assault all across the US from funding cuts, pressures to teach “job skills” and increasing corporate interference. The Enlightenment was did not come about because of political pressures to train workers yet small bore politicians continue to try to reduce universities to instrumental economic tools instead of seeing them as incubators of ideals that will help to lead us toward a more just and sustainable future. Posted in 20 Questions with CCI, CCI Faculty News, CCI News, SCOM Faculty News, SCOM News. 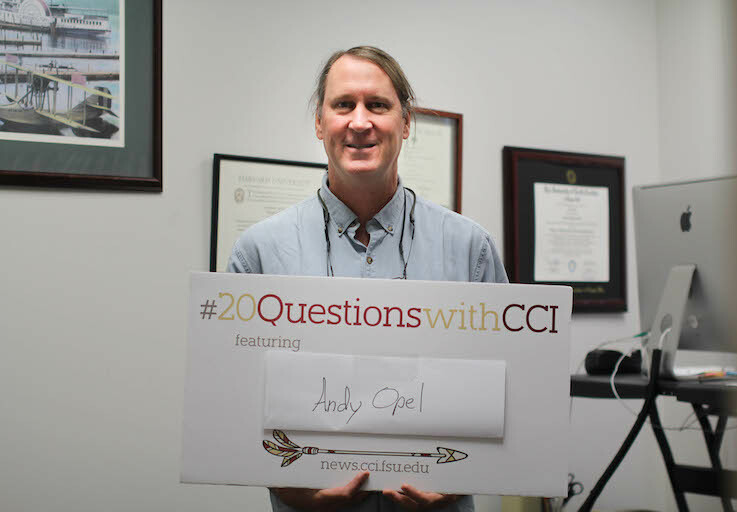 Tagged as 20 Questions with CCI, Andy Opel, School of Communication.